I drink different wines for different occasions. There are my clean, crisp summer whites to enjoy well chilled on my balcony, sweeter whites to pair with spicy food, pinot noir to drink anytime/anywhere (OK, I freakin’ love pinot) and then those red wines that are so big and robust that they can only be enjoyed on a frigid winter night. I live in the San Francisco Bay Area, and it does get chilly here but there are Bay Area winter nights and Vermont winter nights. Two completely different animals. This wine is a Vermont winter night wine. When you come inside from a day of skiing and can’t feel your fingers or toes, open this bottle. This is a three grape blend, dominated by Shiraz. And it is big, bold and spicy. 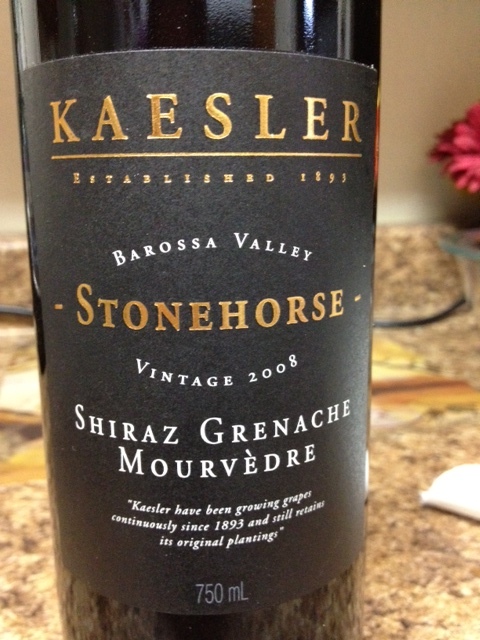 Very dark fruit and lots of spice on the nose… the spices remind me of a dish I had at a Malaysian restaurant. Coriander and star anise. Tons of black cherry, plum and blackberry on the mouthfeel and the finish has lots of spice and berry jam. The fruit in this wine is very ripe and you can tell it has been grown in a hot, dry climate. This is not a wine to be enjoyed on a warm summer night, unless you’re serving it with a juicy steak. This is an apres ski, campfire, or “I just shoveled the driveway and I’m FREEZING” wine. Think savory. Pair with beef stew or chili. And give this one time to develop in the glass. It comes off a bit too “in your face” at first but softens nicely after it has had some air.